The candles are burning inwards, becoming a lantern. The flame makes a round crater inside the candle, in which after burning the whole wick you can put a normal, white candle and... burn it once again. (It should be a high-quality candle and never a tea-light, because its aluminium protection can warm itself too much and damage the candle). All the plants, graphics and all the other items are embedded into the outer layer of the candle, and the wick is carefully selected, so there is no risk of burning the decorations. The candles are only lightning up from the inside. Also the dark candles are white inside and are lightining up. You should allow the wick to burn itself, do not cut it. 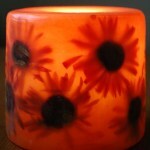 The hole in the candle becomes optimal when the candle is burning approximately 3 to 6 hours. It is possible to let the candle burn during the whole night (the bigger ones are burning at least 300 hours, the small ones at least 200), but it is dangerous to leave the candle unattended. candle and quickly pour out some paraffin. 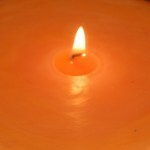 (Do not try pouring it out while the candle is burning, because it will end up with blackening the wall of the candle). 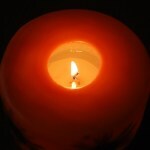 Paraffin candles are very sensitive to changes of temperature. Therefore they should not be exposed to frost (they can crack along the plants stalks) or to the sun (they can lose colour and shape). The best condition for the candles is room temperature. 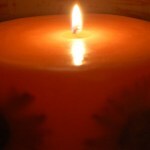 If it is possible, the candles should be kept away from draughts, so the burning hole would be nice and round. If it is not possible, the candle should be turned sometimes. 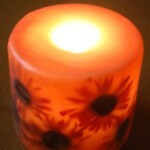 The candles are made from high-quality paraffin, they have no smell, they do not smoulder or smoke. 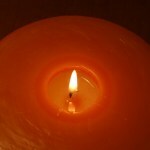 Some aromatic oil can be added, if desired, or the aromatic candle (bright!) can be placed into the hole. The external layer of the candles is the transparent paraffin, so they can be safely placed on the tablecloth without any mat and they will not leave any stains.